Joe Morgan is considered by many to be the greatest modern second baseman and was a key cog on the Cincinnati Reds "Big Red Machine" teams of the 1970s. The two time National League MVP was inducted into the Baseball Hall of Fame in 1990. This top ten list looks at some of the best baseball cards the hobby has to offer for this all-time great. Shop for Professionally Graded Joe Morgan Cards on eBay. Morgan made a few appearances with the Houston Colt .45s — the original name of the Astros franchise — during the 1963 and 1964 seasons before winning over a full-time job in 1965. He was a good player during his time in Houston and showed great offensive potential with his ability to hit for power, draw walks, and steal bases. However, his career really took off in 1972 when the Astros traded him to the Cincinnati Reds. Morgan helped the Reds become one the best offensive teams in modern history while capturing back-to-back World Series titles in 1975 and 1976. During his 22-year career, he made ten All-Star games, won ten Gold Gloves, and a single Silver Slugger Award while playing for the Astros, Reds, Giants, Phillies, and Athletics. 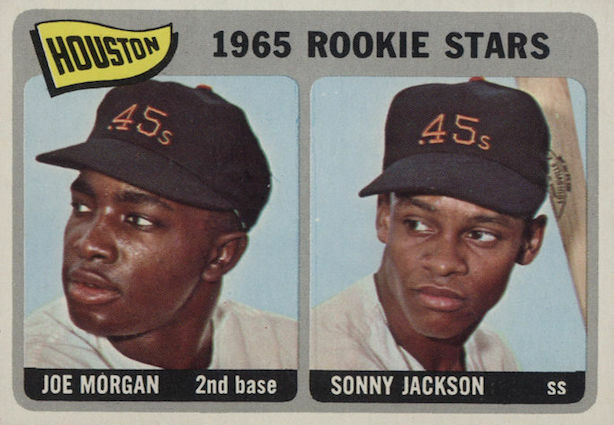 Joe Morgan made his first appearance on a baseball card in the 1965 Topps set, appearing on a Rookie Stars card with Sonny Jackson. His early cards were initially desired based on the fact that he was one of the few good players on the Astros at the time. As his career and stardom accelerated with the Reds, his early cards found broader appeal with collectors and still remain his most popular cards. Morgan's 1970s cards — issued during the peak of his playing career — also have a special place with baseball card enthusiasts. Morgan is extremely popular with collectors from this era of baseball cards, as he appeared prominently in many of the key releases, including the 1971 Topps black-bordered set and the brightly-colored 1975 Topps set. Add in the fact that Morgan's cards from this decade shared space in the Reds team sets alongside notable players like Pete Rose, Johnny Bench, Tom Seaver, Tony Perez, and Dave Concepcion, and it's easy to see why collectors are eager to find the cardboard gems from his playing career. Joe Morgan has remained popular with collectors after his days as a player. He still makes frequent appearances in current baseball card sets and has also been a willing signer for many different card products over the recent years. 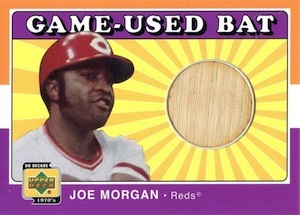 This following guide features ten of the more notable Joe Morgan cards. They range from rookie cards to those issued at the height of his playing career and through to some of his modern cards, including memorabilia and autograph cards. 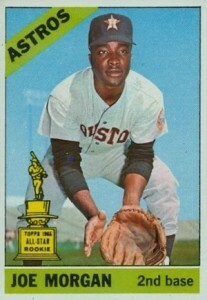 There are plenty of choices for all collectors looking for Joe Morgan baseball cards. 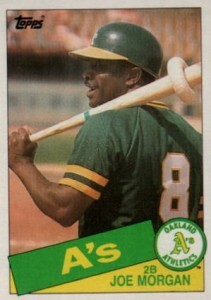 During the closing years of Morgan's career, the Bay Area native returned home, making appearances for the Giants and A's. His final Topps card is found in the 1985 set. This card is inexpensive, and not difficult to find, but it has remained one of his more popular cards from the latter years of the Hall of Famer's career. Collectors can also look for the more limited O-Pee-Chee or Tiffany versions of this card. Joe Morgan featured prominently in this 1975 Topps-inspired Upper Deck set. He has several cards in various subsets throughout the base set, along with a few insert cards. Joe Morgan also makes appearances within the memorabilia checklist for Upper Deck Decade 1970s Baseball set that offered one of his earliest relic cards. His most popular option is his individual bat relic in the Game-Used Bat set. Reds fans might also be tempted to track down the quad bat relic featuring him alongside George Foster, Tony Perez, and Ken Griffey Sr.
Topps Rub Offs were distributed as an insert set with the 1966 Topps set. There were a total of 100 subjects featured on these temporary tattoos and they were printed in long strips of twenty cards. While there was one of these cards in each wax pack, and three in each rack pack, collectors can still find the large uncut sheets. The Topps Rub off for Morgan remains one of his most affordable, and unique, options for collectors looking for cards from early in his career. The 1975 Topps set is one of the most iconic baseball card designs of the decade. The bright colors were a stark contrast to the previous designs that Topps had used. The set also contained several important rookie cards including George Brett and Robin Yount. 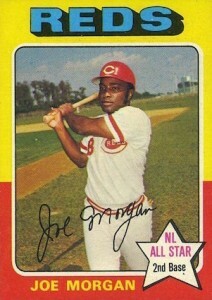 The Joe Morgan card in the set had the added feature of the NL All-Star design in the bottom corner, which was a new feature to Topps sets. This card is extremely popular with graded card collectors and there is also a smaller version in the 1975 Topps Mini set. 1971 Topps Greatest Moments features some of the more difficult and expensive baseball cards from the 1970s. The oversized cards were part of a test product that was only distributed in a few locations. The scarcity and condition-sensitive nature of these black cards have made them very popular with collectors. This is one of the toughest Morgan cards to find and is definitely more of a high-end purchase. 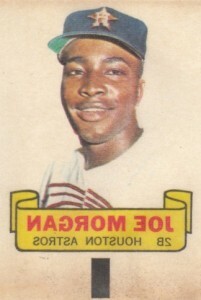 The 1966 Topps Joe Morgan is a second-year card of the Hall of Fame second baseman, but it also represents his first individual card. Reminding collectors how strong his debut was, the popular Topps All-Star Rookie logo appears in the bottom corner. This card offers collectors a more affordable early option outside of Joe Morgan's rookie card. High graded copies of this card can still demand a pretty hefty price. 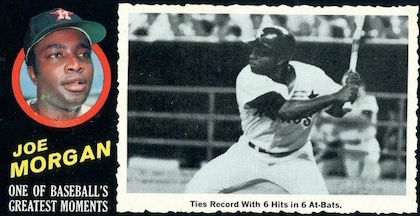 The 1971 Topps Joe Morgan card features a unique action picture of him that was taken from behind home plate. This popular set has long been in-demand with collectors and the Morgan card is one of many Hall of Famers featured in the product. Due to the dark borders, the cards in this set are condition sensitive and there is a premium on clean, raw copies with no chipping on the edges, or high grades. 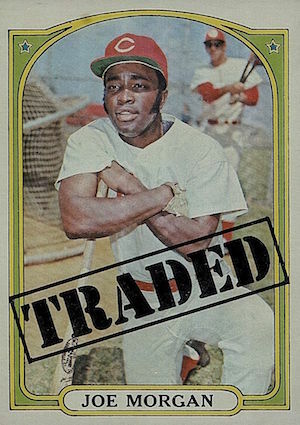 Joe Morgan's first appearance as a Red on a baseball card came in the 1972 Topps set. The monstrous release was noted for its colorful borders, which contrasted nicely to the black border in the previous set. 1972 Topps also had a subset of traded cards at the end of the checklist. 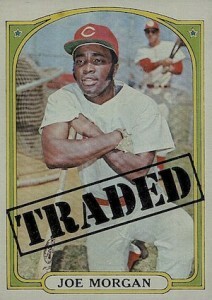 These cards used the normal card design, but the picture featured the player in their new uniform with the word "TRADED" stamped across the front of the card. Morgan's first appearance as a signer for a certified autograph came in the 1992 Upper Deck set. There were 2,500 copies of this card, which sounds like a large number, but given how overproduced this set was, the cards are actually a challenge to find. 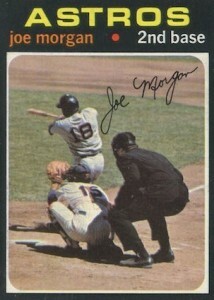 While Morgan has signed for many other baseball products over the years, this autograph stands out for obvious reasons. 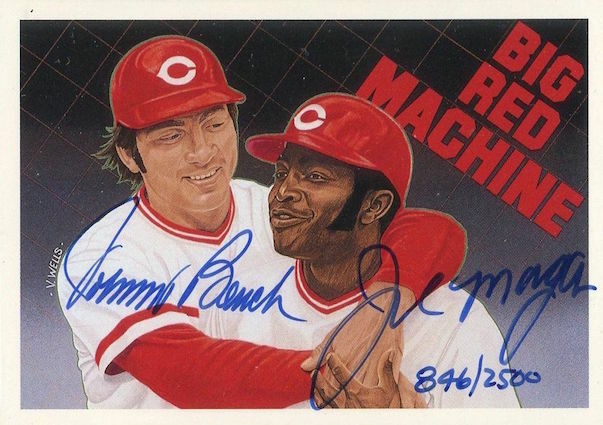 It remains a strong favorite for Reds collectors who can own a beautiful card commemorating one of the best teams in the history of the franchise with on-card signatures for both Joe Morgan and Johnny Bench.